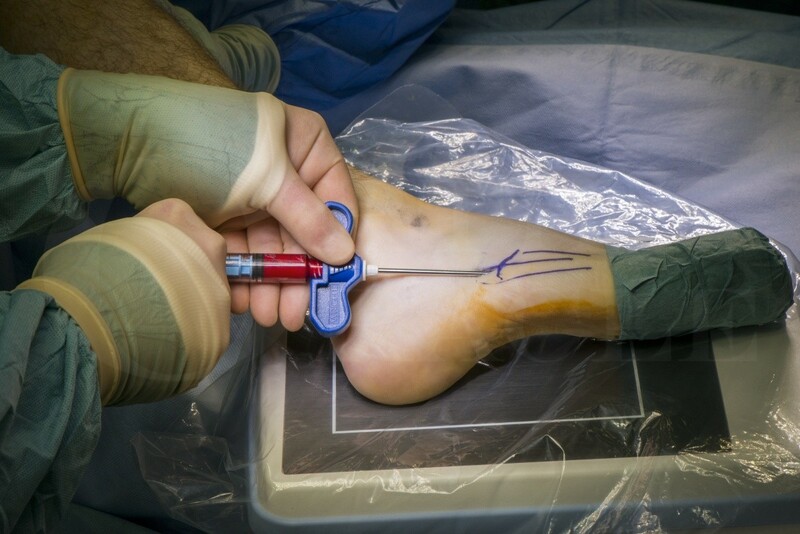 Learn the 5th metatarsal non-union fixation ,using Stryker Asnis cannulated screws surgical technique with step by step instructions on OrthOracle. Our e-learning platform contains high resolution images and a certified CME of the 5th metatarsal non-union fixation ,using Stryker Asnis cannulated screws surgical procedure. Fractures of the 5th metatarsal (MT) are the most frequently encountered fractures in the foot and more than half of these affect the 5th MT especially after sports trauma and can go onto non-union. These fractures require careful evaluation and classification to ensure selection of the optimum treatment. However even classification of these injuries is controversial. The classic thinking relates to the Lawrence and Botte classification which divides the proximal bone into 3 zones (Foot Ankle 1993). Their classification, like so many in those days, was largely based on observation and anecdote. Zone 1 fractures are fractures of the styloid, invariably avulsion fractures of the peroneus brevis. Zone 2 fractures are metaphyseal fractures involving the joint between the bases of the 4th and 5th metatarsal bases —the so-called Jones fracture (named after Sir Robert Jones, who reported his own injury). Zone 3 fractures are diaphyseal and are often stress fractures. A more recent paper by Polzer et al (Injury 2012) argued that only 2 zones need to be considered because they believed that the prognosis of fractures in the 2 more proximal zones is identical. Styloid process fractures (Zone 1) and those involving the joint between the bases of the 4th and 5th metatarsal bases (Zone 2) can thus be managed functionally. They argued that zone 3 injuries (from the Lawrence & Botte classification) need operative management. So in a nutshell, we tend to think of injuries in the metaphyseal region (call this Zone 3) as being the ones with the poorest blood supply and at the highest risk of delayed or non-union. Type 3 fractures should be considered for operative fixation, particularly if there is any cavus posture of the foot, neuropathy, or if the patient is a competitive sportsperson. If surgery is indicated then the argument is that it may reduce the time needed for immobilisation and improve the chance of healing compared to nonsurgical treatment. In this case, a 28 year old athlete whom originally had been treated non operatively presented with clinical and radiographic features of a non union 12 months after the original injury.